When Bradley Cox’s Let the Blind Lead Those Who Can See But Cannot Feel flew under the radar like some cheaply made drone back in 2008, the case could have been made that his side project, Atlas Sound, needed to swap places with Deerhunter and become his main artistic squeeze. An elegant collection of more 4AD-worthy sounds than his primary project, the songs explored the less ironic and socially displaced themes typically found in Deerhunter’s records. His earnest musical intentions revealed, Cox did not need the gauze-and-tourniquet persona that terrified Jimmy Fallon’s studio audience in 2013 to convince fans of his musical cleverness. 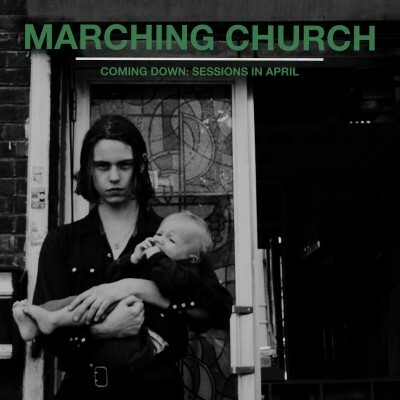 Elias Bender Rønnenfelt of Iceage subconsciously reveals his true embodied spirit on his side project Marching Church’s new EP, Coming Down. Like Cox, Rønnenfelt explores territories his retrofitted band would never dare to discover. Consisting of two tracks, the latter being a fully instrumental 21-minute ode to Ornette Coleman–inspired free jazz, the music grows wildly. No terse arrangements exist here. Where Iceage writes three-minute, reimagined Joy Division romps, Marching Church dismisses time, form, shape and color, achieving more with even more. Rønnenfelt extended the original lineup to include his Iceage bandmate and guitarist Johan Wieth. Like an orchestra pit preparing their instruments for the evening’s performance, “Coming Down” begins at a dirge’s pace with the instruments creating a distinct mood without a flurry of notes. Rønnenfelt wavers in and out of tune. His voice, reminiscent of a young Nick Cave, bellows and broods around the song’s chorus, exclaiming, “I feel like I am coming down / Down below.” No special effects here. The drummer barely hangs onto the meter like drunken men hoisting a casket over their head, making the funeral attendants wonder when they might drop it. Luckily, the rhythm comes to its end without injury. However, the lack of structure makes “Coming Down” an endearing track. Like chance music, a piano note is randomly plucked here, a stringed instrument is plucked there. Lacking the common musical resolution found in most songs, the only indicator that the song finishes lies in the dead air between tracks. A stranger yet equally compelling improv follows in “Coming Down, Part II.” An excerpt of a two-hour jam session, an impressive array of musicians, mainly friends of members of Iceage, take on the spirit of free jazz musicians and construct fragments of movements that take one form, and quickly shift into another, somewhat reminiscent of the previous theme—like first cousins once removed. The melodies drift, subdued and underwhelming. Going nowhere, they never increase in volume past a collection of library whispers. Admittedly, the horns blare several times without warning, yet the excerpt of a two-hour jam session is well chosen.